One word! Delicious! Orange Blossom aroma comes through in this dry, white wine style mead. 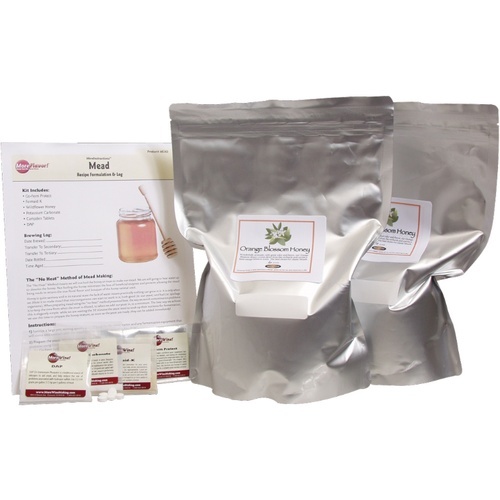 Features 12lb of Orange Blossom honey and all the nutrient and additive packs needed to make a premium mead. Perfect to drink dry or as a sparkling mead, but you can also make this into a Sweet Mead by adding an additional 3-6 pounds of Orange Blossom honey. You would dilute this extra honey with water and add after the first fermentation is complete. The mead came out great! Had to start telling people it was gone to keep them from asking for me for more. Price is excellent too, I couldn't source the honey alone for the cost of the kit.